Our journey to photorealism requires us to understand not only how light works, but also how we perceive colours. How many colours are in the rainbow? And why pink is not one of them? Those are some of the questions that this post will address. This post will introduce the most common techniques used in computer graphics to reproduce the colours that appear in the rainbow. While this might seem a useless exercise, it actually has very practical applications. Each colour of the rainbow corresponds to a specific wavelength of light. This correspondence will allow us to simulate physically based reflections. 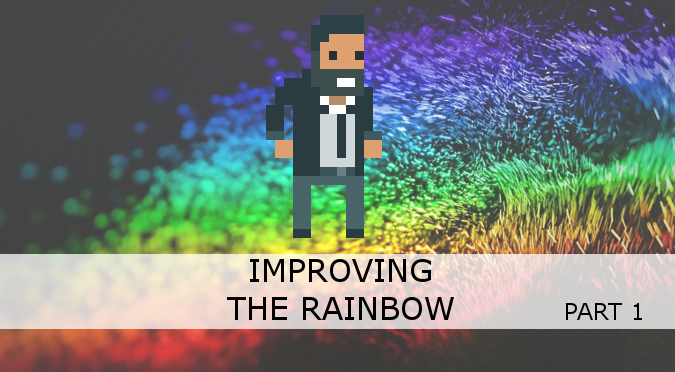 The second part of this post, Improving the Rainbow – Part 2, will introduce a novel approach that is highly optimised for shaders, yet yielding the best results so far (see below). A comparative WebGL versions of all the techniques discussed in this tutorial can be found on Shadertoy. The retina is the part of the eye that is specialised in the detection of light. In there, cone cells are able to send signals to the brain when they detect certain wavelengths of light. Since light is a wave in the electromagnetic field, cone cells work under the same principles that allow us to detect radio waves. Cone cells are, de-facto, tiny antennas. If you have studied electronics, you should know that the length of an antenna is related to the wavelength it captures. This is why the human eye features three different types of cone cells: short, medium and long. Each one is specialising at detecting a particular range of wavelengths. The diagram above shows how strongly each cone cell type reacts to different wavelengths. When one of those cone types activate, the brain interprets their signal as colour. Despite what often stated, the short, medium and long cone cells do not represent specific colours. More correctly, each type responds differently to a different range of colours. It is incorrect to assume that short, medium and long cone cells detected blue, green and red light. Despite this, many textbooks (and even shaders!) rely on this assumption to get a relatively acceptable approximation of an otherwise very complex phenomenon. If we want to reproduce the physical phenomena that make iridescence possible, we need to re-think the way we store and manipulate colours in a computer. 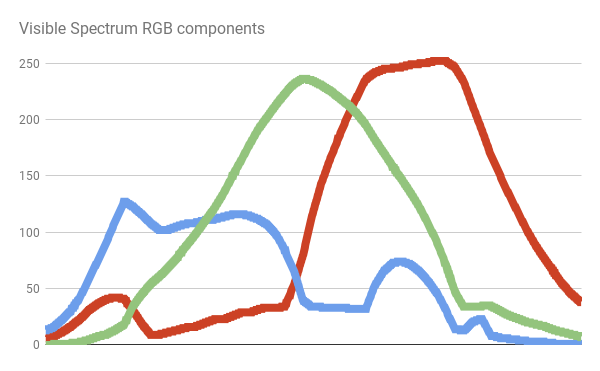 When you create a light source in Unity (or any other game engine) you can specify its colour, as a mixture of three primary components: red, green and blue. 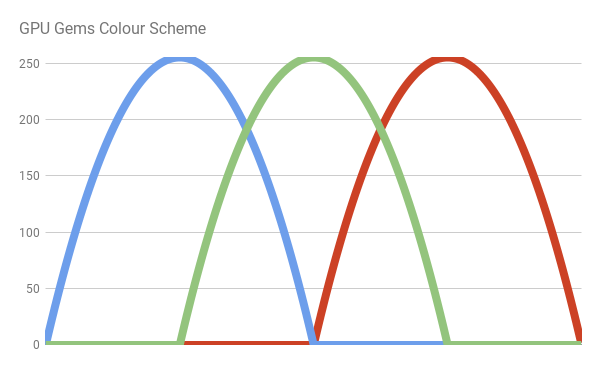 While it is certainly true that red, green and blue lights can be mixed up to create all the visible colours, this is not how light really works at its most fundamental level. A light source can be modelled as a constant stream of photons. Photons which carry different amounts of energy are perceived by our eyes as different colours. However, there is no “white photon”. It is the sum of many photons, each one with a different wavelength, that gives a light its white appearance. For the rest of this series, we will express wavelength in nanometres (a billionth of a meter). The human eye can perceive lights ranging from 400 nm to 700 nm. Wavelengths outside that range do exist but are not perceived as colours. ❓ Why isn't there an optimal solution? The quest for the ultimate map from wavelengths to colours is inevitably doomed to fail. While the nature of light is objective, its perception is not. Cone cells, which are responsible for the perception of specific wavelengths of the visible spectrum present significant variation among different people. Even assuming all cone cells to work uniformly and consistently among humans, their distribution and numbers within the retina are mostly random. No two retinas are the same; not even from the same subject. Finally, the perception of colour depends on how the brain interprets those inputs. That allows for a variety of optical illusions and neural adaptations which make the perception of colours a unique and truly personal experience. The following image shows how the human eye perceives wavelengths ranging from 400 nanometers (blue) to 700 nanometers (red). There is no simple function that can fully reproduce that curve. The easiest, cheapest approach we can implement is simply using that texture in our shader as a mean to map wavelengths to colours. The first step is to make a new texture available in the shader. We can do this by adding a texture property to the Properties block a new shader. In this specific case, we don’t need to enforce wavelength in the range [400, 700]. If the spectral texture is imported with Repeat: Clamp, any value outside that range will automatically appear as black. We will see in a later tutorial that to reproduce iridescent effects we will need to sample several colours from the rainbow. Depending on the device that you are using, your shader might not support sampling texture in a loop. This is, ultimately, the biggest reason why using a texture might not be the best approach, especially on mobile platforms. Sampling a texture might seem a good idea. However, it could drastically slow down put shader. We will see our critical this is in the post on CD-ROMs iridescence where each pixel would require several texture samples. There are several functions that approximate the distributions of colours of the light spectrum. One of the simplest is possibly the JET colour scheme. This is the default colour scheme in MATLAB, and it was originally devised to better visualise astrophysical fluid jet simulations from the National Center for Supercomputer Applications. 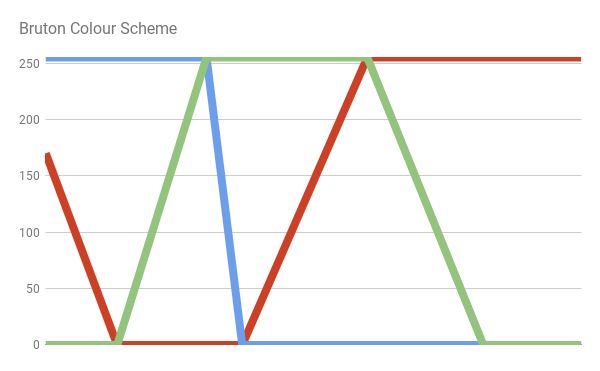 We can easily reimplement the JET colour scheme by writing the equations of the lines that make up the diagram above. The R, G and B values of the resulting colour are capped in the range [0,1] using the Cg function saturate. If your camera is set to HDR (High Dynamic Range Rendering), this is necessary to avoid colours with components that go above 1. Please, note that if you want to adhere strictly to the JET colour scheme, values outside the visible range will not be black. 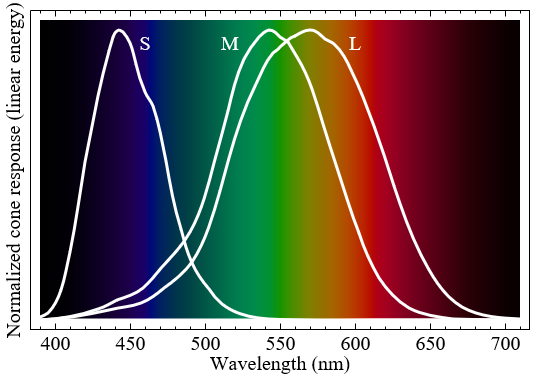 Yet another approach to convert wavelengths to visible colours is provided by Dan Bruton in “Approximate RGB values for Visible Wavelengths“. Similarly to what happened for the JET colour scheme, he starts from an approximated distribution of how colours are perceived. An additional advantage of this colour scheme is that it does not use texture samples or branches, making it one of the best solution if you prefer performance over quality. At the end of this tutorial, you will see a revised version of this colour scheme which provides best performances while still yielding high fidelity of colours. 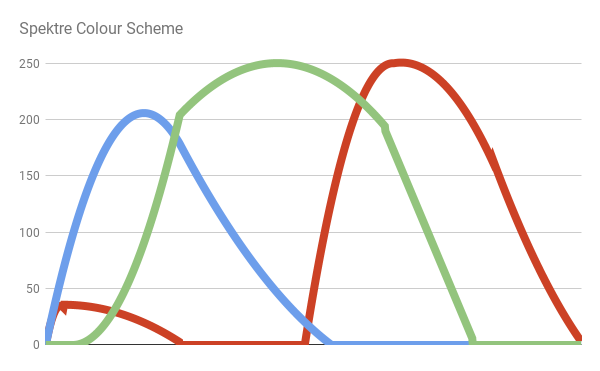 This post provides an overview of some of the most common techniques to generate rainbow-like patterns in a shader. 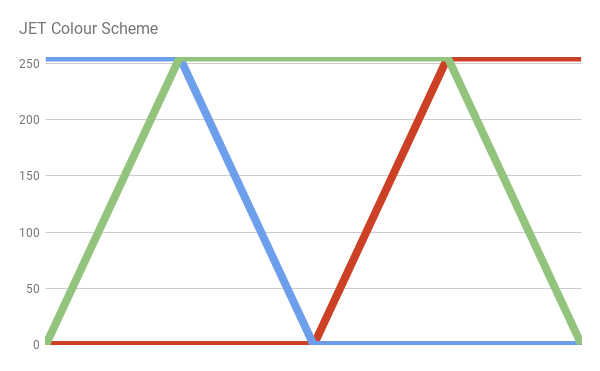 The second part of this post, Improving the Rainbow – Part 2, will introduce a novel approach to solve this problem.